Ayurveda originated in India and has cured all types of diseases for more than 5,000 years. It was widely spread in the Antiquity and its practices were adopted on the whole territory from Tibet and China to Egypt, Ancient Greece and Ancient Rome. However, the connection between this ancient Indian science and the Western world was damaged or even destroyed after the British invasion of the 17th century and the colonization. Upon their expansion the British Empire even closed Ayurveda Schools. Ayurveda was underdeveloped during the previous several centuries as well, because in India this period is marked by severe battles against different invaders together with continuous internal conflicts. In the past decades, Ayurveda returned to the West and is becoming more popular in Bulgaria as well. There already are qualified Indian Ayurveda specialists, for example the team of Ayurveda Clinic, Bansko run by an Indian Ayurveda Guru. Ayurveda is natural medicine and its practices are closely related to yoga. There is no chemistry involved. It uses natural remedies instead – herbs and natural oils whose effects were described by the Ancient Indian wise men and healers. There are more than 50,000 herbal recipes and combination formulas for treating different diseases, collected in medicine treatises dating from even before the New Era. If the Ayurveda healer considers it necessary, minerals or refined metals might be added to some sachets or ointments. Old Ayurvedas have also left us descriptions of how those ingredients work – directly or added to other ingredients to reinforce their action. Ayurveda therapies are completely natural and environment friendly. They follow the natural processes of the human body and focus on the body as a whole instead of treating a single disease. The purpose is an overall recovery of the body and its condition before the disease, as well as reinforcing its natural functions and immunity. That is how happiness is reached. If you are sick and suffering, you cannot feel truly happy for anything in your life. Ayurveda is not only about medicine, it is a complete science related to the philosophy concept of the creation of the Universe and the role of the human being in the universal harmony. 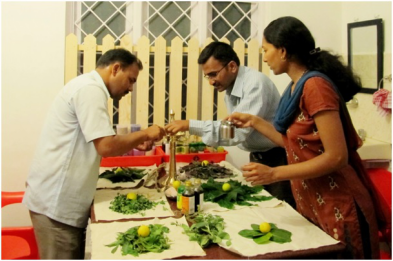 Ayurveda science disposes of rich knowledge in many different areas – from astronomy to bacteria level. As surprising as it may seem to western people, Ancient Indian texts give information on the invisible causes of diseases. According to Ayurveda, diseases appear if the balance between the three energy types of the human body is disturbed. Those energies are present since we are born and determine the distinctive physiological or psychological characteristics of every individual. A lot of time is necessary to understand all this science. But the practical interpretation can begin at the level of everyday life. Diseases are provoked mostly by the toxins accumulated in our bodies. Those disturb the balance and the natural activities of the human body. And poisonous substances come mostly from poor nutrition – type of food, but also eating habits. Ayurveda rules are very simple but the Western world ignores them and they even surprise people. For example, in Bulgaria fruits are seen naturally as a “desert” to be eaten after the main dish, and we have cold soft drinks with lunch. On the contrary, Ayurveda says that fruits should be eaten separately between meals, while during meals the liquids should be reduced. This recommendation comes from digestion. Every food is processed differently and bad combination might result in digestion difficulties. Liquids dilute the gastric juices and therefore can also be harmful. At least 2 litres of water daily should be drunk between meals. Furthermore, food should be consumed up to 3 hours after being prepared. Even if it is healthy in general, the food loses the necessary energy after 3 hours pass. Given that, there is no point in mentioning preserved or processed food which we often consume at home. An Ayurveda professional can prepare a complete healthy diet according to the physiological characteristics of every person.